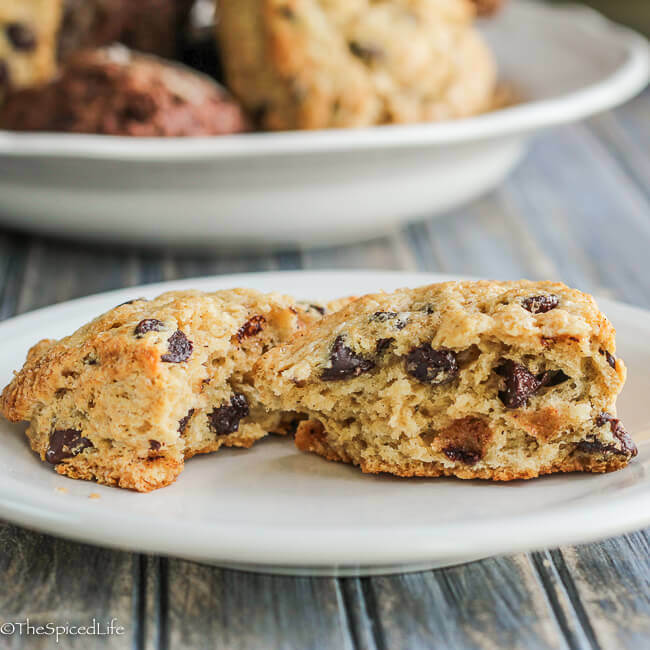 Chocolate scones are delicious–Chocolate Chip Scones are a scone take on chocolate chip cookies and Quadruple Chocolate Scones are just an intensely chocolate scone. Breakfast, afternoon snack, dessert–they work for any occasion! Affiliate links have been used to link to items I am discussing. What does quick bread say to you? Sure I know that loads of baked goods are technically quick breads, but for some reason when I read that this month’s Bread Baking Day theme was quick bread all I could think of was pumpkin bread, zucchini bread and banana bread–the first 2 of which are not really seasonal right now (for me anyway) and, well, let’s just say my aversion to bananas is legendary. Even lemon blueberry bread seems oddly out of place with berry season approaching so quickly but not here yet–and I think I have used nearly all of last summer’s blueberries anyway. So I have been hemming and hawing over my participation. In the meantime, I was thumbing through one of my cookbooks when I saw a chocolate chip scone referred to as a quick bread. 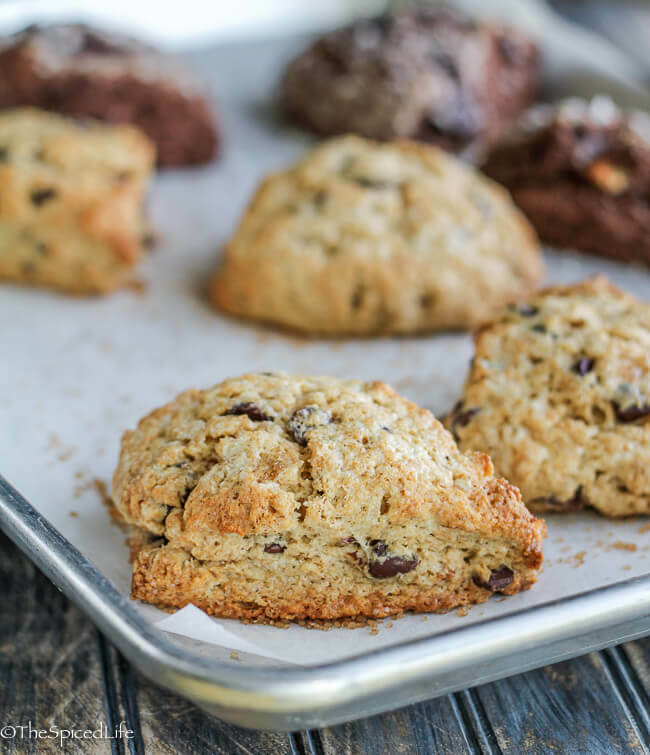 Don’t get me wrong, I know scones are quick breads, but somehow I just had not been thinking about any scones, let alone Quadruple Chocolate Scones or Chocolate Chip Butterscotch Scones as quick bread. But I am a fast learner. In the meantime Nick Malgieri’s The Modern Baker: Time-Saving Techniques for Breads, Tarts, Pies, Cakes and Cookies had arrived in the mail, courtesy of a sale, and I thought I had remembered seeing some chocolatey scones in there, and I was not disappointed. I settled on the Quadruple Chocolate Scones only to see the Butterscotch Scones, with their chocolate chip laden option, at which point I decided I would make both. As my regular readers know, I believe in freezing scones and eating them fresh, so now I have a boatload of frozen dessert scones in my freezer. I made just enough today for us all to try both kinds, fresh and several hours after the fact. The verdicts? 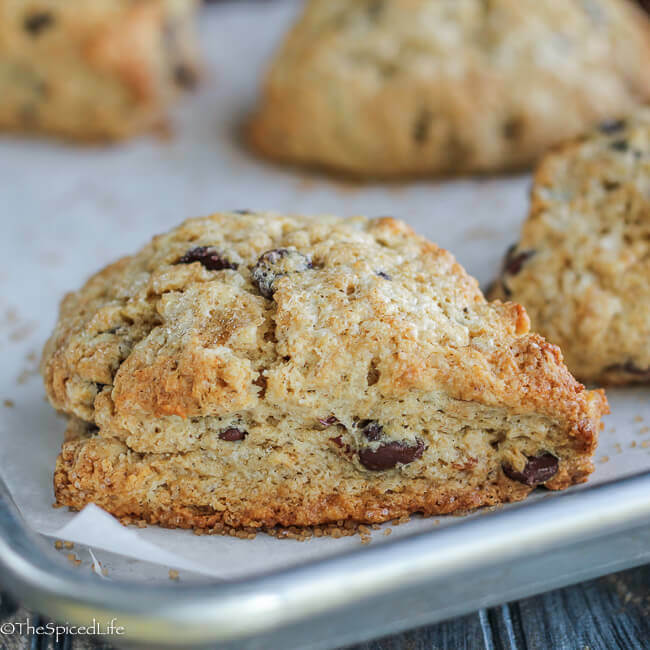 The Chocolate Chip Butterscotch Scones are just hands down terrific. Best fresh, but still great later in the day. 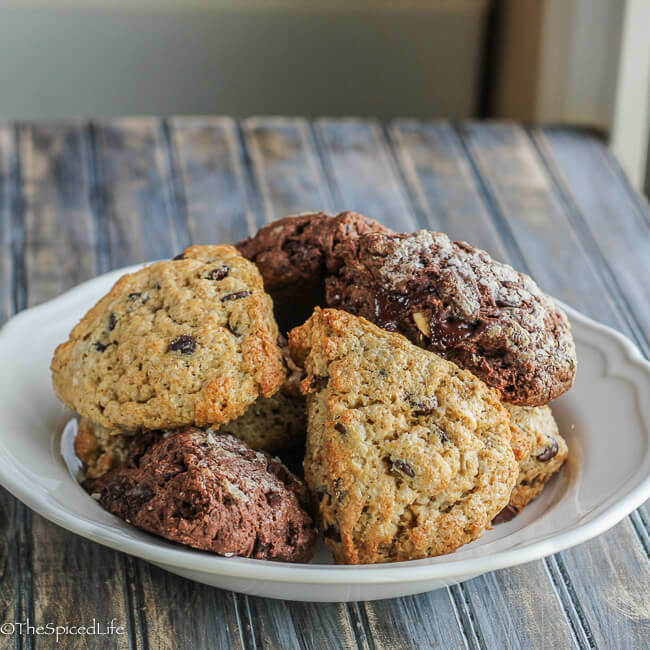 Like a chocolate chip cookie scone–but still a scone. Definitely on the sweet side for a scone, but not, in my opinion, too sweet. The Quadruple Chocolate Scones are excellent but I would do 3 things differently next time. First, I would remember to mix in the chocolate chips at the appropriate moment (ooops). Because I had to fold them in, some bites had a good amount of chocolate and some were bereft–and I really wanted the chocolate. Second, I would use more chocolate chips, just a tad more. And third, I would brush the tops with butter and sprinkle them with coarse sugar because the interior of this scone bordered on dry (in that scone/cocoa powder way–and maybe I needed a fuller fat milk?) and not quite sweet enough. The directions below reflect these changes. (Update October 2015: I made them with these changes and they were excellent. I could not decide which scones I liked more!) Having said all that, my daughter (Alex, the elder at 3.5 YO) strongly preferred the less sweet all chocolate scones. I think maybe Sammy did too, but getting a definitive opinion out of her is harder–she’s 2. 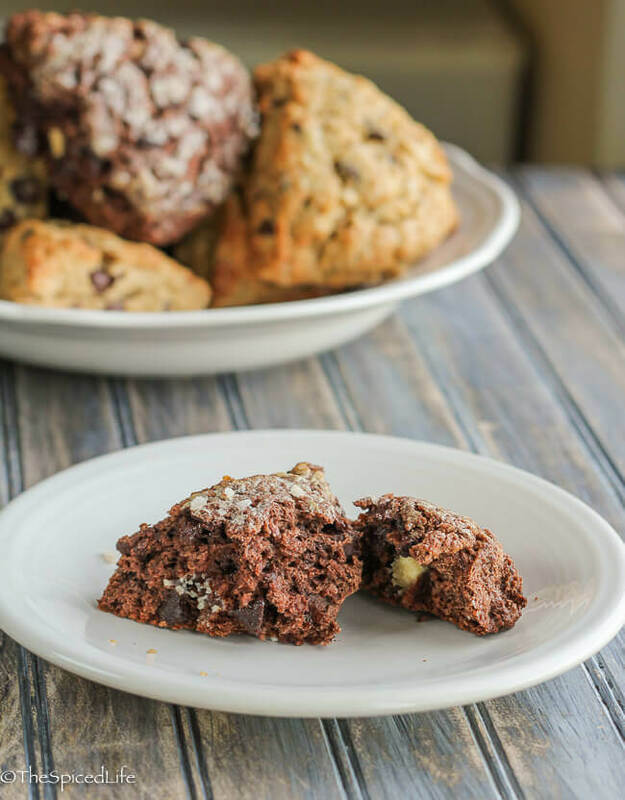 Oh, and if you are looking for Malgieri’s Quadruple Chocolate scones in the book? His are triple chocolate, but I prefer a combination of semi, bitter sweet and white chocolate. These scones are my submission to Bread Baking Day #18, Quick Breads, hosted by Fun And Food Blog. Head over there in early April to see what everyone else made. Preheat the oven to 400F with a rack placed in the middle. Combine the milk chocolate, cocoa powder and sugar in a food processor. Pulse until finely ground but be careful not to over-process or the mixture will melt. If the chocolate is not grinding finely enough, leave it as it will eventually grind down with the flour. Add the flour, baking powder, salt and ground vanilla beans (if using). Pulse 5 or 6 times to mix thoroughly or until the remaining chocolate pieces are ground. Add the butter and pulse until the mixture resembles cornmeal with lumps no bigger than peas. Remove the mixture to a large bowl. Mix the chocolate chips and chopped chocolate in. Whisk together the egg, cream and milk and then pour into the dry mixture. Toss together with 2 forks until the mixture is moistened. Dump it all onto the counter and knead until it is a cohesive ball (just a few folds--do not over-knead). Use a bench scraper or knife to divide the dough into 3 equal pieces for 12 scones (you could also divide in half and do 8 wedges per disc and so forth and so-on). Shape each piece into a ball and then pat it into a disc with a 5 inch diameter (6-7 inches for the 8 wedge version). Use the scraper or knife to cut into 4 equal sized triangles. Place the scones on a baking sheet lined with silicone or parchment paper (or freeze them at this point on a lined baking sheet). Brush each scone with melted butter or heavy cream and sprinkle coarse sugar over the top. Bake for 15 minutes until the scones are well risen and firm to the touch. Serve as fresh as possible. Whisk together the flour, baking powder and salt. Add the brown sugar, whisking thoroughly to break up the brown sugar. Whisk in the salt. Add the butter and cut it in with a pastry cutter (or your fingers), being sure to also break down any remaining lumps of brown sugar. You want the pieces of butter to be no bigger than a pea. Add the chocolate chips and mix in. Whisk together the eggs, cream and vanilla bean paste. Add to the dry mixture and toss with 2 forks to evenly moisten the dough. Turn out onto a clean work surface. Knead the dough quickly, folding over several times, to form a cohesive ball. Place the scones on a baking sheet lined with silicone or parchment paper (or freeze them at this point on a lined baking sheet). Bake for 15 minutes until the scones are well risen and golden brown. I think Valrhona is one of the best brands chocolate to use. The molten scones look absolutely yummy! the molten scones look fabulous. its 9.30 am and I’m craving chocolate…not good!! I think we must be quite alike, you see, today I was in the book store, and instead of getting one baking book, I got two. You, instead of making one scone, made two. The more, the better, when it comes to baking!! Both of these scones look totally stellar. I need to definitely invest in the Modern Baker (which will make 3 news books 🙂 ). Fabulous job! Your scones look delish, especially that chocolate one up there with more chocolate oozing out of it. Wow! Oh my word these sound awesome. That chocolate one looks…well…amazing! 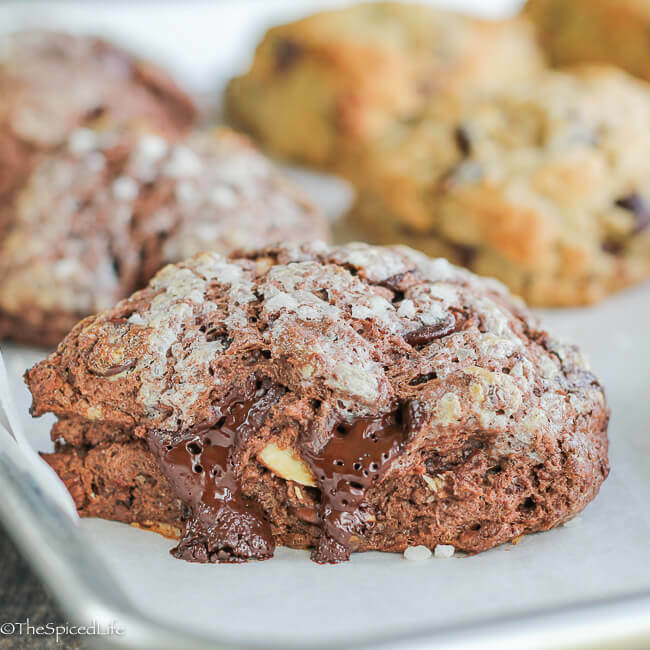 omg, Could I please have the quadruple chocolate scone? That looks divine! By the way, I’ve met Nick several times: the man can ice a cake like no one else. i can not thank you enough for this! 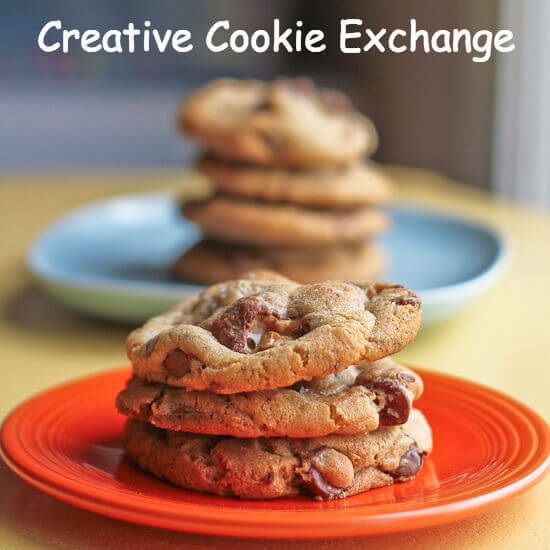 i almost never bake and i just finished the last of the cookie dough i stock-piled and was gonna look for a new idea….this is perfect! 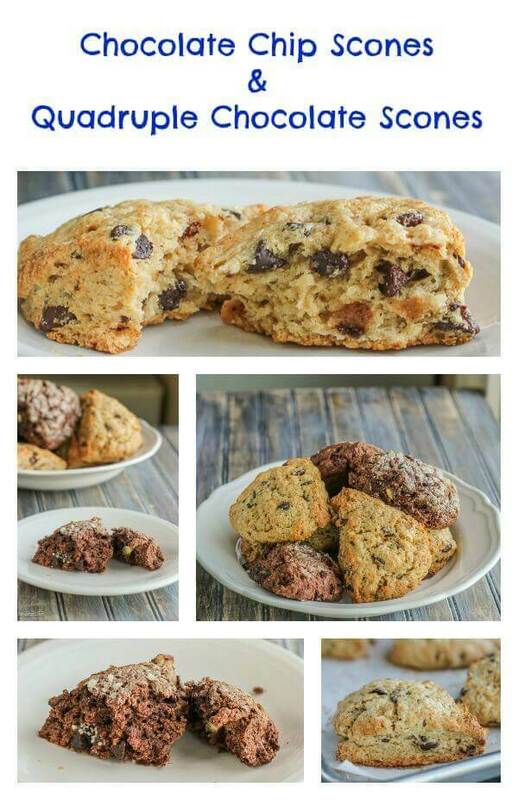 Yum, as a chocoholic I need to make these scones soon! Scones are fabulous and like you said, come together pretty quickly!